A verbal reimbursement claim is not always reliable and a written reimbursement form is the much needed here to understand the exact areas where your employee is asking for the reimbursement. On one hand, such a sample reimbursement form enables you to have a full break-up of the expenses and on the other hand, the form serves as an evidence of the reimbursement claim made and approved by you. 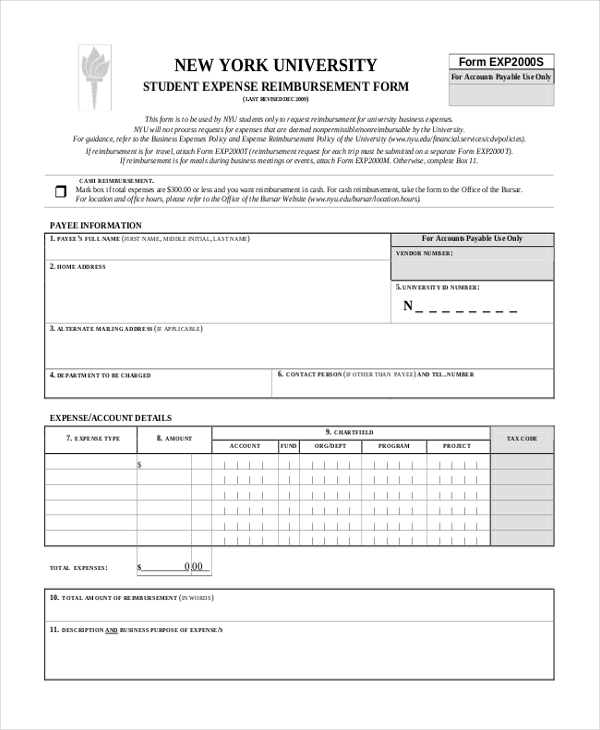 These Reimbursement Forms are needed by employers, insurance companies, and academic institutions. You have a neat and professional Mileage Reimbursement Forms here that will help you to reimburse the travel expenses of your workers. The form covers all major sections like destination, round trip miles, purpose etc. This Medical Reimbursement Forms would be handy for insurance agencies who have to reimburse medical expenses of their medically insured clients. The form will allow you to have complete insights on the medical services accessed by the patient and their expenses. 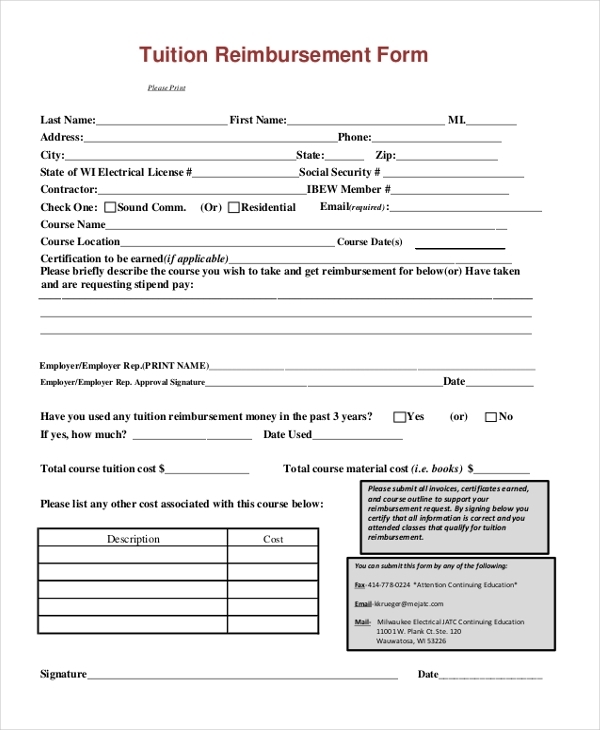 You have a detailed Tuition Reimbursement Forms here that will enable you to gather complete information about the student, the course he or she has taken as well as the list of costs pertaining to the course. This form comes with a detailed table on all the major expenses made on the tour, including their cost center, amount, and GST. The form would be useful for academic institutions who have to reimburse the travel expenses of students. 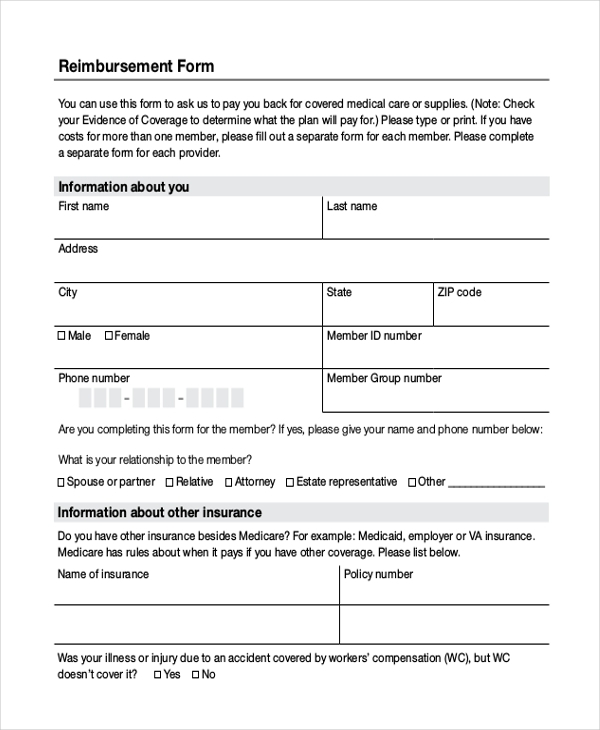 This reimbursement form would enable an insurance company to attain elaborate details about the injury/illness of the client as well as the medical care and supplies and the treatment cost. 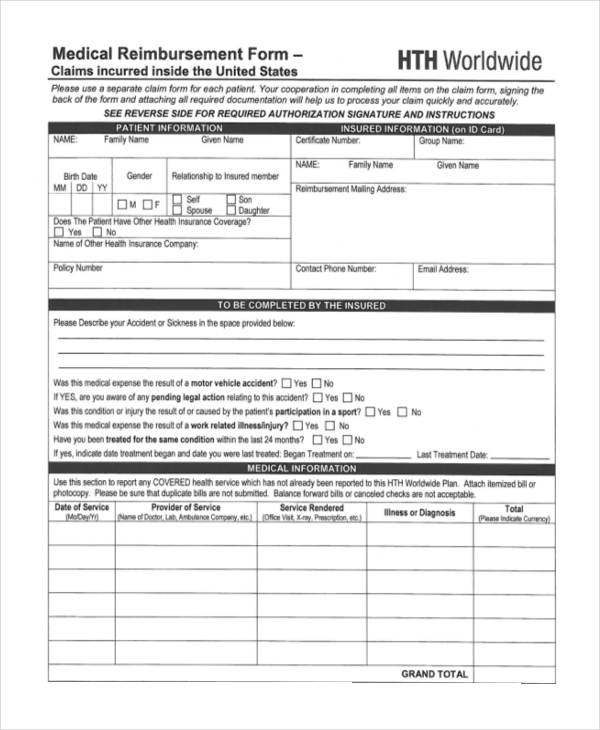 This form would be useful for any employer when he has to know how much he would need to reimburse the employees for the expenses that were supposed to be borne by the office. 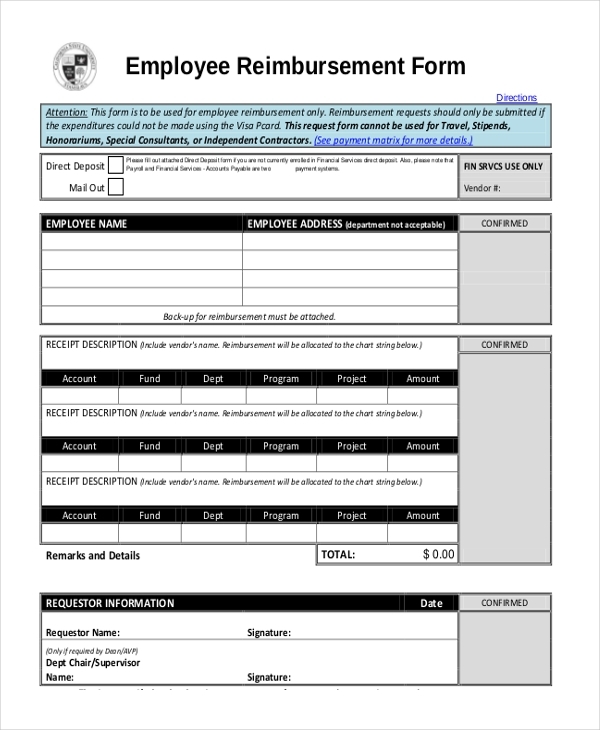 You may also see Employee Reimbursement Forms. 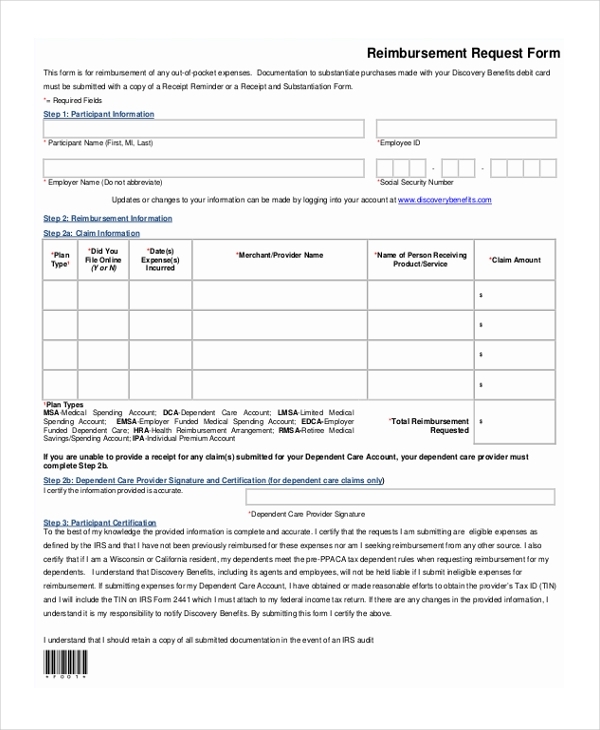 This reimbursement request form not only comes with a sample reimbursement template but also offers instructions on top advising the applicant on the nuances of filling the form. The form concludes with the participant’s certification. You have a standard and elaborate student expense reimbursement form here that would be used to get reimbursed by the university. Added to a table on the expense break-up, there is also a space for defining the business purpose of the expenses. You have a professional reimbursement claim form here that begins with employer’s name, employee details- followed by two detailed tables on Flexible Spending Account as well as Dependent Care Account. 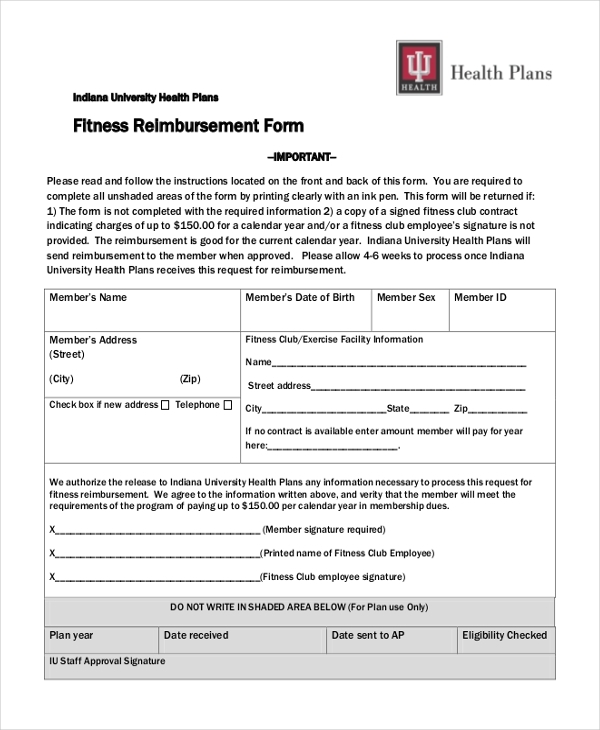 This fitness reimbursement form would be good when your organization is flexible to pay for the fitness club registrations of your members. The form must be signed by the fitness club authority for your approval. 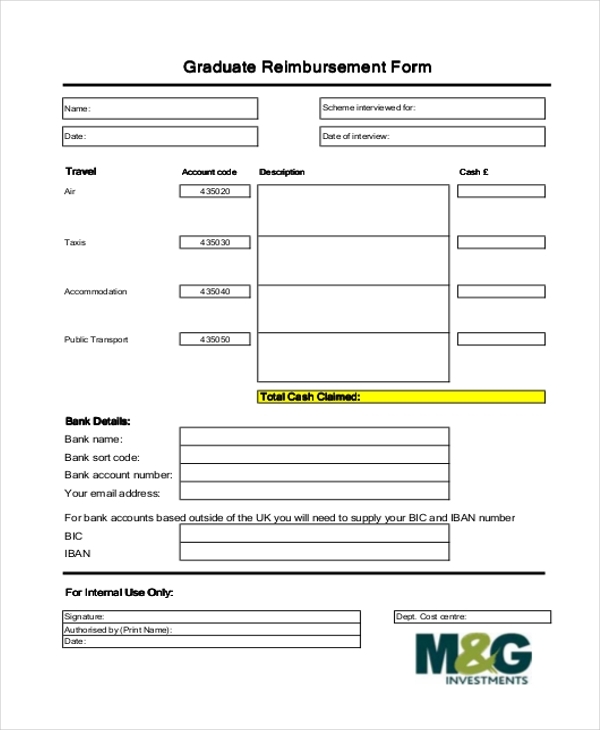 How Does a Reimbursement Form Look Like? 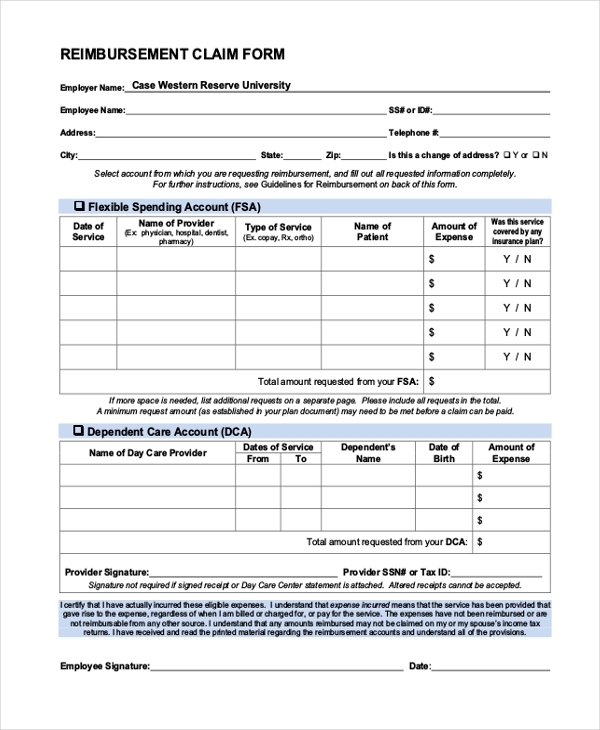 A reimbursement form is meant to inform the reimbursing organization about the payments for certain expenses of its members that the organization is supposed to pay. So, naturally, a standard reimbursement form would contain a table with rows on the type of expenses made as well as the costs of each. Besides, the name of the service provider must also be mentioned in the form. 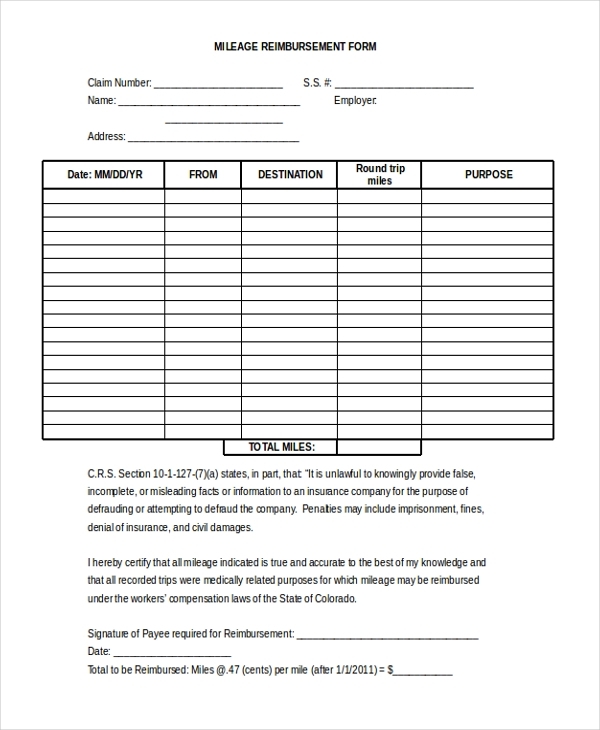 These forms generally start with personal and contact details of the person claiming the reimbursement and conclude with his certification. 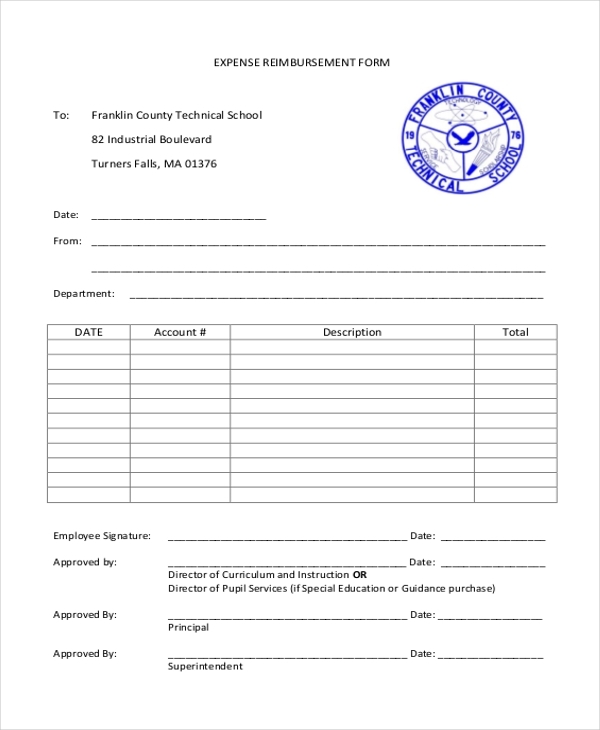 You may also see Petty Cash Reimbursement Forms. What is The Benefit of Reimbursement Form? If you or your organization has declared to reimburse the expenses of your employees or members, you would need the reimbursement form. Such forms generally come up with detailed information on the expenses made by the person and the costs incurred- which eventually enable you to have a complete idea on the map of the expenses. You can check whether the candidate has included any unauthorized expenses for which you are not supposed to pay. Besides, as such forms contain the contact details of the service providers, you can any day contact them for proof. You can also see Nextcare Reimbursement Forms. 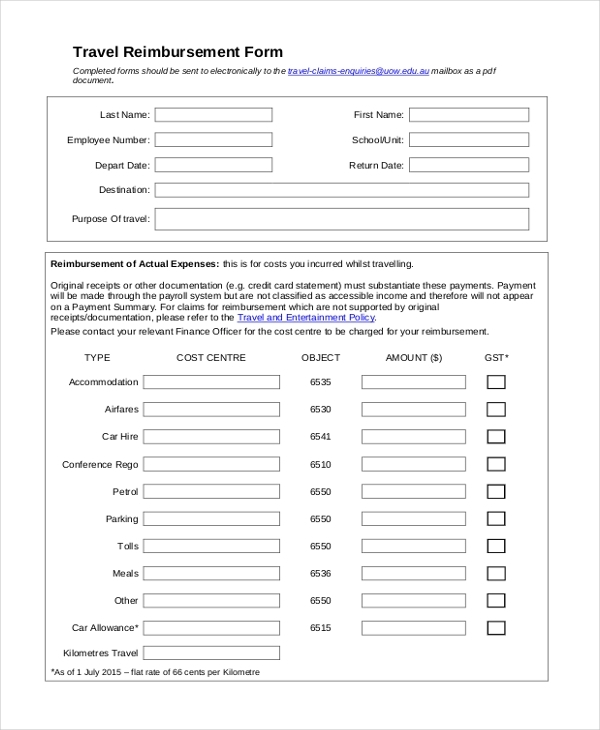 If you are looking for ideas on how to draft a reimbursement form, the templates mentioned above would be really helpful for you. Whether you need Employee Reimbursement Forms or student reimbursement forms or travel reimbursement forms- everything is covered here. They are very convenient to use as well as modify.